Picture take by Ivan Capraro. Photoshopped or not? Even the Museum of Hoaxes can't decide. Well I think they're cute. That is indeed mildly creepy. Looking at the website, the picture labelled (labeled?) "Thought" is pretty neat. Looks real to me, too--or at least, I don't see anything unreal looking. I do lurve the black cats, though! i just got a chance to look at Ananka's Diary, and guess what i find out! i missed seeing Kirsten Miller by a day!!!!!!!!!!! Can you try Fresno, CA? your still in california, right! Anonymous: Noooo, Sorry! But I will be back soon, I promise. I'm saving that picture for later use. We got some cats coming in on my twelve, over. Yeah, they're eyes are glowing, and I can't tell if my screen has just gone photo-shopping over. Don't tell me you're reading Ananka's diary again, over. Evil kitties! Ah! Run for your life! Hey Kirsten, me and my mother our planning another trip for NY, and I was wondering if you knew of any "Off the Beaten Path" places we should go. Thats not creepy. Black cats are good luck! I thought this might be an interesting post. We couldn't fin a picture,but maybe u r better than we r.
Yeah, can you keep track of animal testing? They're planning on making animals without legs, and I want to know when to stop eating meat. love the cats, way cool!!! In part of the australian Herald newspaper today there was a section that said there is this website which has pics of cats the look like hitler. Freeeeeaaaaky!!! thats so rad! first off- i love black cats. second off-i love black and white photograghs. third off-i love photography, so i like this picture, creepy or not(which it isnt ,really). Jasmine: Hey! Thanks for visiting the blog! Annemarie: I owe you a letter! I'll send you some suggestions via myspace. R: Really? A cow and a pig? I gotta look that up. Lorna: Ha! I heard there was some controversy over which cats naturally look like Hitler vs. those that have been photoshopped to resemble him. I think their real, at least, nothing looks fake. Cats do do really weird things. Anouther crazy thing about the picure, is their is a cats, or persons, or a reflection of 2 eyes in the back-seat car window... strange. Lorna: I saw that. xD It was in 'The List', I think. My friend is addicted to that site. But these cats (on the post), I like. They have me thinking, for some reason. It's real. 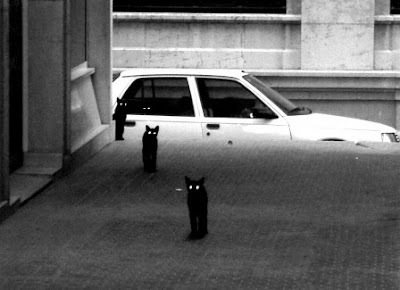 I saw cats like that when I walk outside at night.